Here at GIMME TINNITUS we are super excited to share this new Stickers song with you. It’s called “Sacajawea” and it is the second track to be made public off of Stickers‘ new LP, Swollen. The long player comes out on August 12th via the good folks at End Of Time Recs. “Sacajawea” is a cathartic, emotional blast of no-wave that features plenty of saxophone (naturally). Ed. Note: Follow the soundcloud link to download the mp3 of “Sacajawea”. 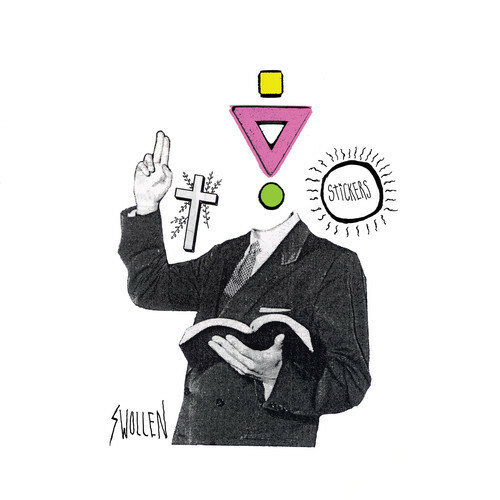 You can preorder Swollen on opaque pink vinyl @ endoftimerecords.storenvy.com. While we are waiting for Stickers to travel East they will be traveling down the left coast with Pissed Jeans this November. 07.27.14 – Seattle, WA – Capitol Hill Block Party @ the Cha Cha * ! And did you catch their music video for “Outlet”? Because you should watch that.